Belmont, MA – McLean Hospital neuroscientists have found that even a brief episode of immune system activation within days of birth can cause persistent changes in sleep patterns concurrent with increases in epilepsy-like brain activity—a combination of symptoms common in autism spectrum disorder (ASD) and other developmental conditions. The detailed findings are available in the January 12, 2018 issue of Neuropsychopharmacology. In humans, ASD is also frequently associated with certain co-occurring medical conditions, such as sleep disorders and seizures. To determine whether early postnatal immune system activation can produce these types of effects, McLean researchers treated mice with a lipopolysaccharide (LPS), a chemical that simulates a bacterial infection and causes a temporary (1-3 day) activation of the immune system. The LPS was given at a time point in mice (9 days after birth) that approximates the stage of brain development in humans at birth after full-term pregnancy. The mice were then implanted with micro-transmitters that enabled the researchers to collect an uninterrupted stream of data on sleep, muscle movement, and activity levels. Data collection continued through 12 weeks of age, a time point considered to represent adulthood in mice. Carlezon, who is a professor of psychiatry at Harvard Medical School, and his team discovered that temporary immune system activation shortly after birth produced two main findings in the adult mice. First, immune-activated mice spent more time in slow-wave sleep, a sleep phase often associated with systemic inflammation. Second, the mice also showed dramatic increases in brief (lasting 2-3 seconds) bouts of abnormal brain wave activity. These events had the hallmark characteristics of spike-wave discharges (SWDs), a type of epilepsy-like brain activity that is not accompanied by full-body seizures. Although the SWDs occurred throughout the day, they were much more prevalent during periods when the mice were sleeping. When they occurred during wakefulness, they were accompanied by complete behavioral arrest—a period of no movement throughout the body—and immediately followed by recovery of normal brain activity and movement. Collectively, these findings demonstrate that even a brief period of immune system activation during critical periods of early development can leave a long-term signature upon the brain. While Carlezon’s research focuses on animal models, his findings have implications for humans. The researchers believe that studying early developmental immune activation in mice may be valuable for diagnosing certain human illnesses and understanding how they develop. Persistent alterations in slow-wave sleep may represent a biomarker that could help differentiate immune-related neuropsychiatric conditions from those with other causes. Meanwhile, understanding epilepsy-like brain activity during both sleep and wakefulness may be useful in developing improved models of ASD. Studies in humans have shown that up to 60% of individuals with ASD experience SWDs during sleep, despite no diagnosis of clinical epilepsy, suggesting accuracy of the mouse model. The SWDs during wakefulness may resemble conditions such as “absence seizures” in humans, which are characterized by a brief loss of consciousness, a blank stare, and cessation of movement, and are often confused with inattention or intellectual disability. “While more research needs to be conducted, these findings are a significant step forward in unlocking the mystery of ASD and other developmental disorders,” said Carlezon. There is a recently well-documented association between childhood epilepsy and earlysymptomaticsyndromeselicitingneurodevelopmentalclinicalexaminations (ESSENCE) including autism spectrum disorder, but the relationship between febrile seizures and ESSENCE is less clear. The Child and Adolescent Twin Study in Sweden (CATSS) is an ongoing population-based study targeting twins born in Sweden since July 1, 1992. Parents of 27,092 twins were interviewed using a validated DSM-IV-based interview for ESSENCE, in connection with the twins’ ninth or twelfth birthday. Diagnoses of febrile seizures (n = 492) and epilepsy (n = 282) were based on data from the Swedish National Patient Register. Prevalence of ESSENCE in individuals with febrile seizures and epilepsy was compared with prevalence in the twin population without seizures. The association between febrile seizures and ESSENCE was considered before and after adjustment for epilepsy. Age of diagnosis of febrile seizures and epilepsy was considered as a possible correlate of ESSENCE in febrile seizures and epilepsy. The rate of ESSENCE in febrile seizures and epilepsy was significantly higher than in the total population without seizures (all P < 0.001). After adjusting for epilepsy, a significant association between febrile seizures and autism spectrum disorder, developmental coordination disorder, and intellectual disability remained. Earlier age of onset was associated with all ESSENCE except attention-deficit/hyperactivity disorder in epilepsy but not with ESSENCE in febrile seizures. In a nationally representative sample of twins, there was an increased rate of ESSENCE in childhood epilepsy and in febrile seizures. Febrile seizures alone could occur as a marker for a broader ESSENCE phenotype. Perinatal Immune Activation Produces Persistent Sleep Alterations and Epileptiform Activity in Male Mice. Increasing evidence suggests a role for inflammation in neuropsychiatric conditions including autism spectrum disorder (ASD). Previous work in rodents has established that immune activation during critical developmental periods can cause phenotypes that reproduce core features of ASD, including decreased social interaction, aberrant communication, and increased repetitive behavior. In humans, ASD is frequently associated with co-morbid medical conditions including sleep disorders, motor hyperactivity, and seizures. Here we use a ‘two-hit’ immune-activation paradigm to determine if perinatal immune activation can also produce these co-morbid features in mice. In this paradigm, we treated timed-pregnant mice with polyinosinic:polycytidylic acid (Poly I:C), which simulates a viral infection, on gestational day 12.5 according to an established maternal immune activation regimen. A subset of the offspring also received a second ‘hit’ of lipopolysaccharide (LPS), which simulates a bacterial infection, on postnatal day 9. At 6 weeks of age, mice were implanted with wireless telemetry transmitters that enabled continuous measurements of electroencephalography (EEG), electromyography (EMG), locomotor activity, and subcutaneous temperature. Effects at 7 and 12 weeks of age were compared. Both prenatal Poly I:C and postnatal LPS produced changes in locomotor activity and temperature patterns, increases in slow-wave sleep, and shifts in EEG spectral power, several of which persisted at 12 weeks of age. Postnatal LPS also produced persistent increases in spontaneous bursts of epileptiform activity (spike-wave discharges) that occurred predominantly during sleep. Our findings demonstrate that early-life immune activation can lead to long-lasting physiologic perturbations that resemble medical co-morbidities often seen in ASD and other neuropsychiatric conditions. Neuropsychopharmacology accepted article preview online, 06 October 2017. doi:10.1038/npp.2017.243. Children with autism are more likely to show severe social symptoms if their mother had chronic asthma or allergies while pregnant, the University of Sydney’s Brain and Mind Centre reveals today in Molecular Psychiatry. The findings suggest an ‘immune-mediated subtype’ of autism driven by the body’s inflammatory and immunological systems. Children of mothers who reported a history of immune activation had more caregiver-reported social deficits. Individuals with both rare and common types of autism spectrum disorder share a similar set of epigenetic modifications in the brain, according to a study published November 17 in Cell. More than 68% of individuals with different types of autism spectrum disorder show evidence of the same pattern of histone acetylation—a chemical modification of the protein scaffold around which DNA wraps. The findings suggest that a single global epigenetic pattern affecting shared molecular pathways in the brain could underlie diverse manifestations of this psychiatric disease. Various genetic and environmental factors are known to contribute to ASD. Many studies have focused on structural changes to the genome or DNA sequence variants in protein-coding genes, but these mutations are rare and account for only a small fraction of cases. As a result, scientists have proposed that epigenetic modifications—changes in gene activity that do not affect the DNA sequence—play an important role in ASD. However, many epigenetic studies have focused on a chemical modification of DNA known as methylation, ignoring other important changes that could affect the activity of genes implicated in psychiatric disease. Because these epigenomic abnormalities point to specific genes and pathways that are altered in the ASD brain, some of them could turn out to be novel drug targets. Moreover, the study suggests that epigenetic drugs, which are increasingly entering the market as a result of discoveries in the cancer field, could potentially be repurposed for the treatment of ASD. “Currently there are no approved drug treatments specifically for ASD, but we do hope that studies such as ours, as well as the downstream work that is surely needed, will eventually lead to new treatments,” Prabhakar says. ” Surprisingly, however, we found even greater enrichment of ASD-Up DA peaks near genes upregulated at 10–12 months after birth, which corresponds to the stage of synapse formation, and neuronal maturation. In contrast, ASD-Down DA peaks did not show stage-specificity. 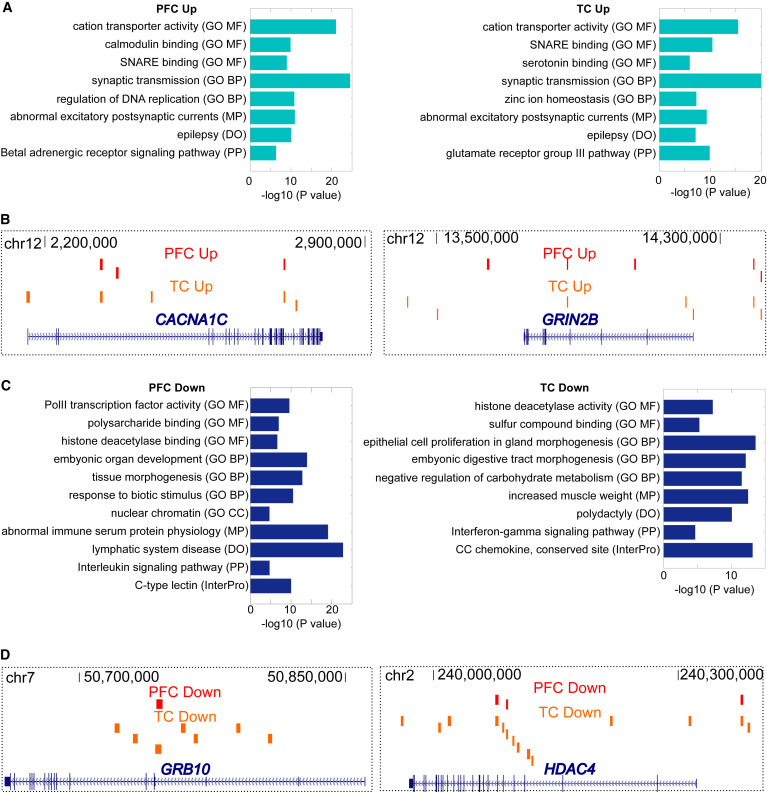 Thus, although chromatin aberrations in ASD affect genes with a broad variety of developmental specificities, genes upregulated at or near 12 months after birth are particularly strongly associated with increased acetylation in ASD cortex. Autism spectrum disorders (ASDs) affect as many as 1 in 45 children and are characterized by deficits in sociability and communication, as well as stereotypic movements. Many children also show severe anxiety. The lack of distinct pathogenesis and reliable biomarkers hampers the development of effective treatments. As a result, most children with ASD are prescribed psychopharmacologic agents that do not address the core symptoms of ASD. Autoantibodies against brain epitopes in mothers of children with ASD and many such children strongly correlate with allergic symptoms and indicate an aberrant immune response, as well as disruption of the blood–brain barrier (BBB). Recent epidemiological studies have shown a strong statistical correlation between risk for ASD and either maternal or infantile atopic diseases, such as asthma, eczema, food allergies and food intolerance, all of which involve activation of mast cells (MCs). These unique tissue immune cells are located perivascularly in all tissues, including the thalamus and hypothalamus, which regulate emotions. MC-derived inflammatory and vasoactive mediators increase BBB permeability. Expression of the inflammatory molecules interleukin (IL-1β), IL-6, 1 L-17 and tumor necrosis factor (TNF) is increased in the brain, cerebrospinal fluid and serum of some patients with ASD, while NF-kB is activated in brain samples and stimulated peripheral blood immune cells of other patients; however, these molecules are not specific. Instead the peptide neurotensin is uniquely elevated in the serum of children with ASD, as is corticotropin-releasing hormone, secreted from the hypothalamus under stress. Both peptides trigger MC to release IL-6 and TNF, which in turn, stimulate microglia proliferation and activation, leading to disruption of neuronal connectivity. MC-derived IL-6 and TGFβ induce maturation of Th17 cells and MCs also secrete IL-17, which is increased in ASD. Serum IL-6 and TNF may define an ASD subgroup that benefits most from treatment with the natural flavonoid luteolin. Atopic diseases may create a phenotype susceptible to ASD and formulations targeting focal inflammation of the brain could have great promise in the treatment of ASD. ROCHESTER, Minn. — The bacteria in your gut do more than break down your food. They also can predict susceptibility to rheumatoid arthritis, suggests Veena Taneja, Ph.D., an immunologist at Mayo Clinic’s Center for Individualized Medicine. Dr. Taneja recently published two studies ─ one in Genome Medicine and one in Arthritis and Rheumatology ─ connecting the dots between gut microbiota and rheumatoid arthritis. A connection between the bacteria living in the gut and immunological disorders such as multiple sclerosis have long been suspected, but for the first time, researchers have detected clear evidence of changes that tie the two together. Investigators from Brigham and Women’s Hospital (BWH) have found that people with multiple sclerosis have different patterns of gut microorganisms than those of their healthy counterparts. In addition, patients receiving treatment for MS have different patterns than untreated patients. The new research, published in Nature Communications, supports recent studies linking immunological disorders to the gut microbiome and may have implications for pursuing new therapies for MS.
Weiner and colleagues conducted their investigations using data and samples from subjects who are part of the CLIMB (Comprehensive Longitudinal Investigation of Multiple Sclerosis) study at Brigham and Women’s Hospital. The team analyzed stool samples from 60 people with MS and 43 control subjects, performing gene sequencing to detect differences in the microbial communities of the subjects. Samples from MS patients contained higher levels of certain bacterial species – including Methanobrevibacter and Akkermansia – and lower levels of others – such as Butyricimonas – when compared to healthy samples. Other studies have found that several of these microorganisms may drive inflammation or are associated with autoimmunity. Importantly, the team also found that microbial changes in the gut correlated with changes in the activity of genes that play a role in the immune system. The team also collected breath samples from subjects, finding that, as a result of increased levels of Methanobrevibacter, patients with MS had higher levels of methane in their breath samples. Neuropathological Mechanisms of Seizures in Autism Spectrum Disorder. This manuscript reviews biological abnormalities shared by autism spectrum disorder (ASD) and epilepsy. The peripheral neuropil, which is the region that contains the inhibition circuits of the minicolumns, has been found to be decreased in the post-mortem ASD brain. ASD and epilepsy are associated with inhibitory GABA neurotransmission abnormalities including reduced GABAA and GABAB subunit expression. These abnormalities can elevate the excitation-to-inhibition balance, resulting in hyperexcitablity of the cortex and, in turn, increase the risk of seizures. Medical abnormalities associated with both epilepsy and ASD are discussed. These include specific genetic syndromes, specific metabolic disorders including disorders of energy metabolism and GABA and glutamate neurotransmission, mineral and vitamin deficiencies, heavy metal exposures and immune dysfunction. Many of these medical abnormalities can result in an elevation of the excitatory-to-inhibitory balance. Fragile X is linked to dysfunction of the mGluR5 receptor and Fragile X, Angelman and Rett syndromes are linked to a reduction in GABAA receptor expression. Defects in energy metabolism can reduce GABA interneuron function. Both pyridoxine dependent seizures and succinic semialdehyde dehydrogenase deficiency cause GABA deficiencies while urea cycle defects and phenylketonuria cause abnormalities in glutamate neurotransmission. Mineral deficiencies can cause glutamate and GABA neurotransmission abnormalities and heavy metals can cause mitochondrial dysfunction which disrupts GABA metabolism. Thus, both ASD and epilepsy are associated with similar abnormalities that may alter the excitatory-to-inhibitory balance of the cortex. These parallels may explain the high prevalence of epilepsy in ASD and the elevated prevalence of ASD features in individuals with epilepsy.